Chetsün Sengé Wangchuk (Tib. ལྕེ་བཙུན་སེང་གེ་དབང་ཕྱུག་, Wyl. lce btsun seng ge dbang phyug) (11th–12th centuries) was an important figure in the Nyingtik lineage. He received the complete transmission of the Vima Nyingtik from Dangma Lhundrup Gyaltsen‎‎ and passed it on to Gyalwa Shyangtön Tashi Dorje. In addition, Vimalamitra himself appeared to him and gave him empowerments, guidance and instructions, and at the age of one hundred and twenty-five, he attained the rainbow body, vanishing into the sky in a cloud of rainbow light. 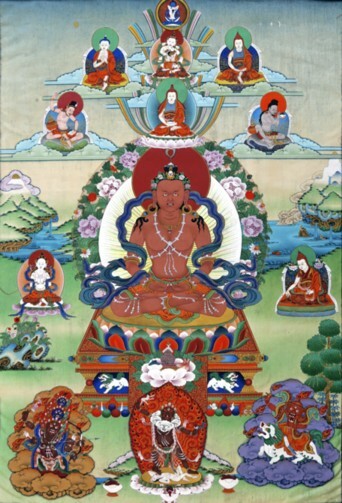 According to Jamyang Khyentse Chökyi Lodrö's commentary on the Chetsün Nyingtik and the opening section of the terma, Chetsün Sengé Wangchuk attained rainbow body on the tenth day of the seventh Tibetan month. Before passing away, he gave his last instructions to the dakini Palgyi Lodrö. He was reincarnated as the great nineteenth century master Jamyang Khyentse Wangpo, who, recollecting his past life in a vision and receiving the teaching back from the dakini, brought out the very important cycle of teachings known as Chetsün Nyingtik. Dudjom Rinpoche, The Nyingma School of Tibetan Buddhism, Its Fundamentals and History, trans. and ed. by Gyurme Dorje (Boston: Wisdom, 1991), pages 557-559. Nyoshul Khenpo, A Marvelous Garland of Rare Gems: Biographies of Masters of Awareness in the Dzogchen Lineage, Padma Publications, 2005, page 85. This page was last edited on 4 September 2015, at 14:41.